For the Seventh Sitting of the Second Regular Session of the National Assembly of the Republic of Serbia in 2007 which was convened by the Speaker of the National Assembly, Mr Oliver Dulic for 26 December, and which started at 2,15 p.
1. The Report of the State Negotiating Team on the negotiations conducted under the mandate of the Contact Group Troika on the future status of Kosovo and Metohia in the 10 August – 19 December period and the Proposal of the Resolution of the National Assembly of the Republic of Serbia on the protection of the sovereignty, territorial integrity and constitutional order of the Republic of Serbia. 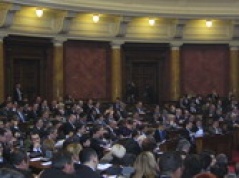 The Assembly sitting, held at the National Assembly House was attended by Boris Tadic, the President of the Republic of Serbia, Dr Vojislav Kostunica, President of the Government of the Republic of Serbia, Dr Slobodan Samardzic, Minister of Kosovo and Metohia and the ministers of the Government of the Republic of Serbia. In his address to the members of parliament, President Tadic stated that the Government will do all in its power to keep Kosovo in Serbia, and Serbia on its way top Europe. The Serbian President stressed that Serbia will never accept the independence of Kosovo, adding that announcements of a unilateral pronouncement of independence of Kosovo have come from Pristina before and that Serbia will immediately pronounce any decision of this kind invalid. It is his opinion that the solution of the future status of Kosovo and Metohia must be brought in the UN Security Council, as well as that this UN organ must agree with any change in the composition of the civil and military mission in the Province. Tadic reiterated that Serbia advocates the continuation of negotiations on the status of the Province announcing that he will represent Serbian state policy at the new session of the UN Security Council dedicated to Kosovo and Metohia, on 9 January. In his speech, the Serbian President stated that both principles – keeping Kosovo in Serbia and Serbia on its way to Europe “must be realised through wise politics, peaceful and diplomatic means” concluding that “isolation from the rest of the world and war can neither help Serbia keep Kosovo, not ensure economic perspective for its citizens”. Focusing on the course of the negotiations so far, Tadic deemed that the State Negotiating Team has done its job well, consistently pleading the principle of keeping Serbia’s territorial integrity and sovereignty. He expressed his belief that giving up the principles on which the Government of the Republic of Serbia and the protection of Kosovo and Metohia are founded ”would essentially be a surrender before the problems Serbia faces”. In his address to the members of parliament, the President of the Government, Dr Vojislav Kostunica stated his belief that all are unified behind Serbia’s rejection of any kind of independence of Kosovo once and for all and that this is Serbia’s first and last word on the subject. The Prime Minister stressed that, at this moment, Serbia’s last line of defence against violence and unilaterally pronounced independence must be the National Assembly’s strong resolution to reject any independence of Kosovo. Kostunica stressed that on 19 December at the session of the Security Council discussing the Report of the mediating Troika, Russia’s initiative to continue the negotiations process was prevented through the intervention of America and several European countries, blocking the Security Council’s work on finding a compromise solution for the future status of Kosovo and Metohia. At the same time, the USA and some western countries announced that, after the Serbian Presidential Elections, they will recognize the unilateral independence of Kosovo based on Ahtisaari’s rejected plan. Kostunica said that America has opted for open violation of international law and the United Nations system for the purpose of achieving its own military security interest, not the interest of the Albanian national minority in Kosovo and Metohia. Also, the USA consciously sacrifices Serbia’s state and national interests for the sole purpose of making a quasi-state creation in which, as Annex 11 of Ahtisaari’s plan states, the NATO pact would be the “final organ” of government in “independent Kosovo”. The Prime Minister pointed out that America has power on its side, but that the law is on Serbia’s side, that Serbia can rest easily because its strength lies in upholding the law and defending the simple truth that Kosovo is Serbia. He repeated that Serbia advocates the continuation of negotiations until a compromise is reached, and that all decisions must be passed in the Security Council. Serbia expressly objects unilateral acts and demands strict adherence to the UN Charter and SC Resolution 1244. Kostunica emphasised that the fight for Kosovo is the fight for Serbia’s freedom and that, as any other people, Serbs must fight for their future and to keep Serbia whole. He also added that it would be best to agree to live peacefully with Kosovo Albanians, together and free, because Kosovo is big enough to achieve the interests of both sides. Kostunica said that Serbia owes a debt of gratitude to Russia because it has been a firm and principled ally all the while, defending international law and Serbia’s right not to have its territory usurped. The Minister of Kosovo and Metohia, Dr Slobodan Samardzic, made several comments on the course of the four-month negotiations process and accused the USA and certain countries of the European Union of encouraging obstruction in and demotivating the delegation of Kosovo Albanians in the talks on the status of the Province. The shadow of a final solution and promised independence prevented them from joining in the negotiations and reaching a compromise solution, although the talks were somewhat more open. It is obvious from the Report of the Negotiations Troika that an opportunity was created in the course of the negotiations for Russia to propose a continuation of the negotiations in the Security Council, which it did at the session on 19 December. The proposal was endorsed by five countries, but was blocked by the USA and certain countries of the European Union. Samardzic said that the State Negotiating Team acted according to the innovative platform and that the negotiations were boosted by Serbia’s strong diplomatic activity in its defence of state interests, enabling Serbia to gain additional international capital. Afterwards, the members of parliament conducted a joint discussion on this item on the agenda. At the beginning of the discussion the Presidents of the Serbian Radical Party Deputy Group, Tomislav Nikolic, Socialist Party of Serbia Deputy Group, Ivica Dacic, Liberal Democratic Party Deputy Group, Cedomir Jovanovic, G17 Plus Deputy Group, Suzana Grubjesic, Minority Deputy Group, Balint Pastor, Vojvodina Deputies’ Group, Nenad Canak and Democratic Party of Serbia – New Serbia – Dr Vojislav Kostunica Deputy Group, Milos Aligrudic requested to be heard. Before the conclusion of the discussion in which most of the members of parliament participated, the President of the Government of the Republic of Serbia, Dr Vojislav Kostunica, delivered the closing address. He stressed that Serbia can enter into international agreements only in the way determined by the Constitution of the Republic of Serbia, which means whole and intact. The Prime Minister repeated that the European Union’s decision to send an EU civil mission to Kosovo to replace the UN mission is illegal from the standpoint of international law and Security Council Resolution 1244. It is his belief that the SC Resolution may only be replaced by another resolution passed in the Security Council and which could only be reached through the negotiations which are now blocked. Finally, Kostunica called upon al the members of parliament to vote in favour of the proposed Resolution of the National Assembly, because what Serbia needs today is unity of the state for the purpose of keeping Kosovo and Metohia. Since the joint discussion was completed, the Speaker of the National Assembly, Oliver Dulic, set the Voting Day on the only item on the agenda of the Seventh Sitting of the Second Regular Session of the National Assembly of the Republic of Serbia in 2007 on 26 December at 10.37 p.m.
With 150 votes “in favour”, 19 “against” and three abstained, the National Assembly adopted the Report of the State Negotiating Team on the negotiations conducted under the mandate of the Contact Group Troika on the future status of Kosovo and Metohia in the 10 August – 19 December period. With 220 votes “in favour”, 14 “against” and three abstained, the National Assembly adopted the Proposal of the Resolution of the National Assembly of the Republic of Serbia on the protection of the sovereignty, territorial integrity and constitutional order of the Republic of Serbia. Since the National Assembly had conducted discussions on the only item on the agenda and decided upon it, Speaker, Dulic, concluded the Seventh Sitting of the Second Regular Session of the National Assembly of the Republic of Serbia in 2007.